David Putters at Shell gets on stage at SIINDA 2018, to discuss the importance of an effective location marketing strategy when working towards ambitious customer acquisition and global growth plans. David Putters, Global Product Manager Web at Shell, spoke in a collaborative session with Addiko Bank (a national bank chain in Croatia) at this year’s SIINDA (Search Information Industry Association) conference in Dubrovnik, Croatia. The topic they were discussing was specifically around big brands and growing them from a local to global level. Putters initiated the session to explain just how big Shell Retail is, as the number one mobility retailer in the world. Shell is much larger than even BP (British Petroleum) and Total combined, with a presence in over 70 markets and more than 44,000 locations. To date, Shell services over 30 million customers on a daily basis. Its goal is to serve over 40 million customers each day and expand to over 55,000 sites in a whopping 90+ markets by 2025. The audience heard how Shell Retail has five ambitions to reach its goals by 2025, but for purposes of the presentation Putters decided to focus on ambition number four. This is around treating every customer like a guest, not only on the Shell forecourt, but in the digital world, to improve customer loyalty and improve the volume of their customer base. Site data management is important to make this ambition a reality – the station locator on the local Shell websites gets over 500,000 visits a month. He admitted that searchers don’t always go to the Shell website to find their nearest fuel station, they will often make use of search engines instead. As Shell received more and more complaints that the information on Google was inaccurate, it was clear that the time had come to also take ownership of the site data outside of Shell applications. 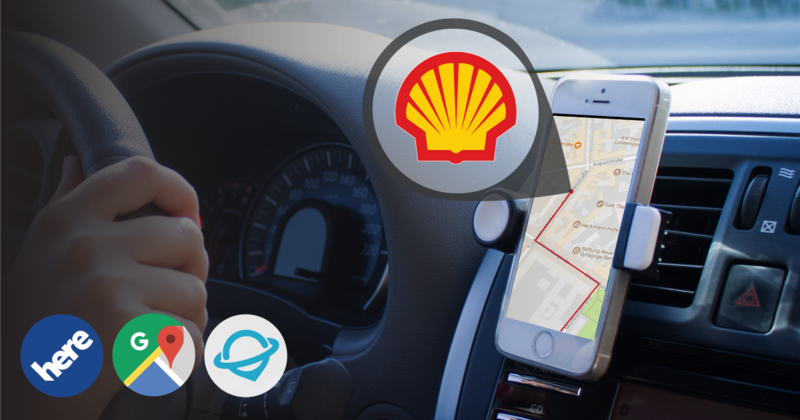 Looking for a location marketing solution provider to improve the accuracy of Shell’s listings, Putters set out with a test pilot of 1,000 locations in the UK with Navads, an Uberall company. After some careful analysis of key publishing channels, such as Google and HERE, the team discovered that 15% of business listing profiles were missing on Google My Business and 27% were missing on HERE. Working closely with Navads, Putters saw that these channels generate more than 125,000 clicks on Google driving directions alone. Due to the intent and demand-based searches, this made it clear for him that location management for Shell Retail was of very high importance. After the successful pilot, Shell rolled out Navad's solution on a global level. Putters went on to share the internal complexities that were to be considered. Internally, Shell is a big and complex organization, with many different departments on both a global and local level, who are all involved in the process. It is important to work with each local market separately to get approval and commitment before a solution can be rolled out on a global scale. Due to the potential lack of priority and available resources within local teams, this is not always easy. He also noted that not all local markets maintain the same high standards of data accuracy. In fact, one particular, very important market still doesn’t maintain opening hours of its sites, which is a crucial piece of information for customers. The different business models in different countries also poses a challenge, all with different processes of data capture, maintenance, etc. For individual retailers, we make an effort to get them on board with the global processes. Although there is sometimes limited knowledge and interest from retailers about their digital presence. And when they do want to play in this space, there is a huge focus on Google alone, which jeopardizes the global process in place to keep the site data synchronized across all different channels. Despite these challenges, Putters confirmed they are seeing great results so far and it gives them a great foundation to build on in the near future. When pulling together the most accurate data, Shell needs to ensure that they optimize each location to show services and amenities, such as Shell V-Power fuel (specialized fuel type) or a car wash. Shell Corporate (David Putters essentially) works with the local markets to ensure that the data across all 44,000 global sites are current, up-to-date and accurate. This helps to build trust and take strides towards their ambitious 2025 customer acquisition goal to cater to over 40 million customers every day. How does this one-man-powerhouse do it? He employs Uberall's Navads as an efficiency tool, to streamline process and manual verification, integrate tech and automate redundant tasks with technology, making it a win/win for global brands. So what can we expect from the future of Shell? Putters introduced the term “Forecourt Retailing”, which is a demand generation delivery model that Shell recently introduced to the Netherlands, as a trial market. In partnership with Deliveroo, they have locations that deliver select goods from the retail shop directly to customers. Other exciting developments which Putters briefly discussed include new loyalty programs, and connected car and mobile payment options, like Fill Up & Go in the UK. In 2019, Shell will open the Site of the Future in Vancouver, which will be well worth a visit. During the closing Question and Answer session Putters revealed that they are trialing a service called Shell TapUp, a service that will deliver fuel directly to the customer, instead of customers going to a station, leaving the car with a completely full tank and the customers with a digital receipt. It’s exciting to see how “fill her up” is evolving in response to customer demand. Some want to pay digitally, some want to spend time in the shop, while others prefer to sit down with a coffee and use the free wifi… whatever the customer desires both online and offline, Shell is doing its best to cater to their myriad needs. Kelly Benish is VP Partner Marketing US at Navads, an Uberall company, and heads up US and Canadian expansion and business development in partnership with Lex ten Veen, EVP Partnerships. Benish has blogged for Street Fight, BIA Kelsey, NetNewsCheck and others specifically about recruitment, strategy, transformation and local search. She also shares thought leadership at industry-recognized conferences such as BIA Kelsey, Local Media Association, Local Search Association, Search Marketing Expo, Association of Alternative Newsweeklies, National Newspaper Association, Association of Directory Publishers and many more.